Life, and Nothing More... undercut Where Is the Friend's Home? by acknowledging the falseness of its diegetic reality as it added another layer of verisimilitudinous falsity to the narrative. 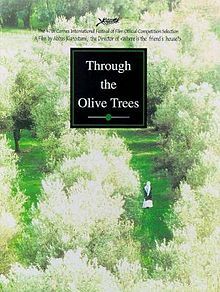 Through the Olive Trees takes this simple elevation from one dimension of diegesis to another and fractures it into a thousand pieces; the film's opening image is of a man who introduces himself, "I'm Mohamed Ali Keshavarz, the actor who plays the director." With these 10 words, Kiarostami sets off the largest meditation on the thin line between reality and fiction of his self-reflexive career. That sentence serves as a warning shot for the rest of the movie, making it practically impossible to distinguish between what particular plane of "reality" the film is on at any one time. So perplexing is its Gordian knot that even cutting the thing by acknowledging the fictionality of the whole piece cannot successfully unravel its complexity. But as with Close-Up, Certified Copy or any of the director's examinations of confused diegetic reality, Through the Olive Trees never loses its emotional resonance amidst its metatextual fun. The primary focus of the film is a pair of people who existed in the background of the previous movie. Late in Life, and Nothing More..., the lead actor (who is playing the director, but not the director who introduced himself at the start of this movie, because he is the "director" of Life) meets a young couple who elected to marry despite losing nearly all their family the earthquake that ravaged the region. Kiarostami aligns the focus of this film onto that couple. Well, the actors who played that couple, at least. As Kirostami moves laterally as well as vertically, he lets his characters take over the film somewhat and to diverge from the roles they play down the line of the Koker trilogy. Tahereh, who plays the young woman in Life, is anything but the lovestruck wife of that film. When paired with Hossein, the "groom," she comes off as cold and uninterested even when the boy begins to feel some of the attraction of his character. Hossein even flubs his lines repeatedly in a hilarious scene where the filming of one of Life's shots constantly goes wrong because Tahereh refuses to respond to anything Hossein says to her, even in character. (It should be noted that her silence does not mean what Western audiences might think it means, but more on that later.) For his part, Hossein actively seeks that his part in the film not simply mirror his real life. A stonemason by trade, Hossein demands that his character not be a stonemason so that he need not even have to fake the work he does not like. Yet even these conflicted, delineated marks between reality and fiction are soon absorbed into the denser web of the larger film, which even uses shot and sound design to blur lines. The drifting, focus-bending style that dotted the previous two Koker films rears its head again from time to time, and once again, the biggest yet most welcome distraction comes from an old man who seizes control of the film for a few minutes to ramble amiably. Then the film suddenly snaps back to attention by floating back to Hossein, and the sense of the movie making room for the real world dissolves when the old man's laughter blends with the honking of nearby geese in a deliberately false effect. An early camera shot that looks out from the car Tahereh takes to set seems to be a POV shot until one realizes the impossibility of it being the perspective of anyone inside the car, contradicting its naturalist feel with clear artifice. Poor Hossein later gets so mixed up by the film that when his character should say he lost 65 relatives in the quake, he instead says that he lost 25 because that is how many of his own relatives died in the disaster. In perhaps the film's most surreal moment, the actor playing the director of Life, and Nothing More... instructs the actor playing the director of Where Is the Friend's Home?, and at one point the camera reverses 180 degrees as if the director roles reverse, just to add to the confusion. All of these bits are amusing—even Hossein's mix-up over the death count, though it comes from a horribly honest place—but they also speak to the Koker trilogy's larger breakdown of the very notion of capturing reality with film. By moving outward, cinema only adds more layers of falsity, and even reality (or at least what passes for reality within the false framework of film) cannot be trusted. Case in point, the way that Tahereh's tacit interaction with Hossein is obscured by both Kiarostami's camera and differences in cultural behavior. Her silence actually communicates cautious interest, not disdain, but even when one knows that, her actions feel rude and cold. The final scene, of a playful back-and-forth between the two as Hossein attempts to woo Tahereh, serves as the cap to this trilogy's ambiguity and its sense of ambiguity as the inevitable result of any attempt to capture a full portrait of something. As the camera pulls back ever further, its vast canvas does not reveal the truth of the couple's outcome but instead obscures it. Something will always be omitted in a movie, whether through too narrow a focus or too broad. Godard continues to look for a way to "get it all" in a film, but Kiarostami gracefully admits defeat in such a way that he makes an equally grand artistic statement out of his failure. Godard famously once said, "Film begins with D.W. Griffith and ends with Kiarostami." Through the Olive Trees almost seems the literal embodiment of this thought.